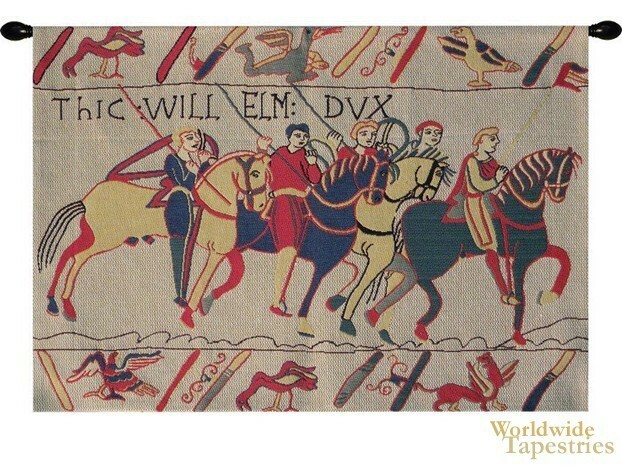 This Bayeux Chevaliers tapestry shows William the Conqueror and his men on horseback in the Battle of Hastings in 1066. Based on the original created in England and now displayed in France, we see William, Duke of Normandy on his way to battle. William the Conquerer was the first Norman king of England and reigned from 1066 to 1087, and was a descendent from the Vikings, and was an integral part of English history. After his death, the lands were divided into Normandy for his eldest son Robert, and England to his younger son William. Such was his part in history. This Bayeaux tapestry is backed with a lining and a tunnel for easy hanging. Note: tapestry rods and tassels, where pictured, are not included in the price.